Many of you may wonder how a job at aasman goes from a client’s communications problem or opportunity, to a multifaceted, engaging campaign. It has taken many years to get our process running like the well-oiled machine it is today, but we feel like we’ve earned our black belts when it comes to delivering precise, informative and pretty darn attractive creative. Let me break it down for you with one of our recent campaigns. We want to develop a relationship with our clients, one that’s filled with a deep understanding of who they are and what they’re after. And where do all relationships start? A first date. We’ll ask you questions, get to know your values, your wants and dreams. We’ll really get down to the heart of the matter. With Undiscovered Campgrounds, it all started with a workshop (and some coffee). Once we reflect on who you are and what you’re trying to achieve, we can structure the things we’ve learned and create a direction to follow. This entails a marketing position. We like to arrange these in a triangle format, where the bottom tier points to the next, and so on. Eventually we arrive at the very tip of the triangle: the essence of the campaign. This position is the foundation for the campaign and will consistently be referenced throughout the rest of the process. Here’s our triangle in action in our market positioning for the Undiscovered campaign. It’s written right on our walls that ‘no idea is a bad idea,’ and when it comes to brainstorming that couldn’t be more true. Brainstorms are a flurry of creative solutions, with the market positioning keeping us grounded. The room becomes electric and when lightning strikes, the campaign really starts to come alive. After the clouds part and the sun dries up the puddles, we are left with one clear creative solution that will shape the core messaging and visual identity of a campaign. Our brainstorm has left us with a great idea. But it’s just words, so now what? This is where “the magic” happens. Our creative team brings their skills to bear on this narrative thread and converts it into a visual representation. They ask (and answer) such questions as, what colours do these values represent? What imagery and typography will engage this particular audience? What kind of personality delivers this message? By relentlessly asking and answering the important questions, the creative solutions present themselves. The team then goes about designing them to be visually accessible to the intended audience. Now that the campaign has gone from conceptual to visual, we can determine the best ways and places for it to thrive. We’ll carefully pick and choose tactics that make sense for your audience, make a plan and schedule the whole campaign from beginning to end (also known as a communications strategy, if you want to get technical). From the strategy, we can start designing all parts of the campaign. With the Undiscovered Campgrounds campaign, this included a variety of tactics including posters, online ads, Yukon-wide mailers and even some swag. They say if you love something you should set it free. And that brings us to our final step, the release, or campaign launch. 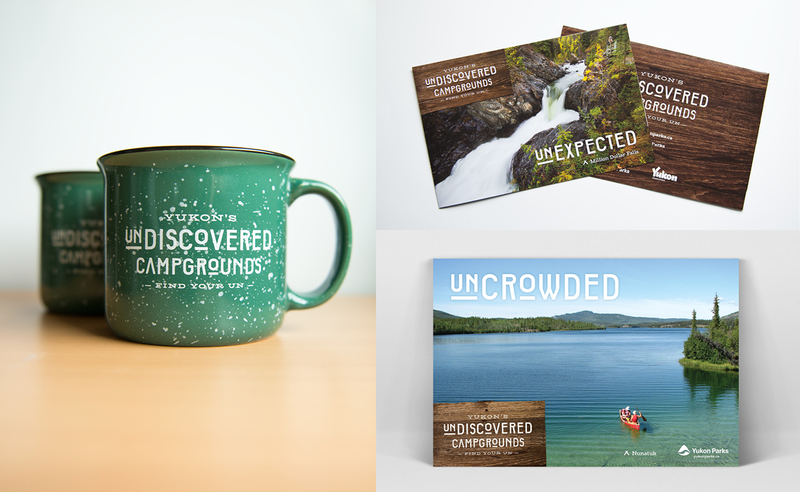 You may have noticed the Undiscovered Campgrounds campaign around the Yukon. Maybe you’ve checked out a new-to-you campground. And with that, there is another successful campaign under our black belt. If you have a campaign in mind that could use aasman expertise, contact us for a free consult.